Are you really changing the name of British Petroleum to Beyond Petroleum　? This question was answered by Sir John Browne, BP’s CEO, in 2000. No, of course not. The words 'Beyond Petroleum' are 'a kicker' - the pay-off line in the current advertising campaign that sums up how the company has changed as a consequence of recent mergers and acquisitions and how it will change further in the future as we expand into new areas beyond our traditional business of finding and selling oil and oil-related products. transferring BP's Engineering Polymers business to Solvay and Solvay's polypropylene (PP) business to BP, and creating a joint venture in high density polyethylene (HDPE). 2011/9 BP to Expand Activities in Biofuels, Buying Out Remaining Shares in Brazil's Tropical Bioenergia S.A.
BP To Sell Jonah Gas Operations in Wyoming, U.S.
History: BP's predecessors include Burmah Oil and Anglo-Persian Oil. Anglo had the first oil strike in the Middle East in 1908; the British government bought 51 percent in 1914, eventually selling its interest in 1987. British Petroleum completed its $55 billion acquisition of Amoco on Dec. 31, 1998, creating Britain's biggest company and the third largest oil company in the world. 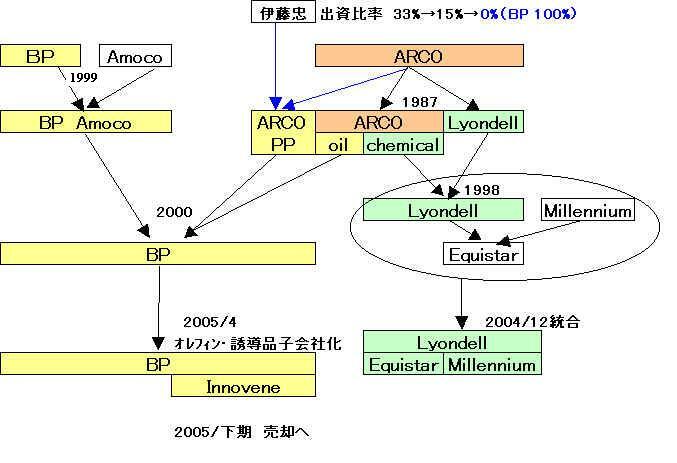 In April 2000, the U.S. Federal Trade Commission "unanimously approved BP Amoco PLC's $27.6 billion purchase of Atlantic Richfield Co. after the company agreed to sell Arco's Alaskan large oil holdings. The BP Polyethylene Business is a leading producer of polyethylene, with a full range of low density polyethylene (LDPE), linear low density polyethylene (LLDPE) and high density polyethylene (HDPE) products for the packaging, agricultural, consumer goods and construction sectors. We are also major licensors of cutting edge process and catalyst technologies to the global polyethylene market. The Polyethylene Business is one of the largest business units in BP's Chemicals stream, with access to over 1.9 million tonnes per annum of polyethylene capacity. The business supplies the film market sectors with Innovex linear low density resins based on both butene (C4) and higher alpha olefin (C6) comonomers. Novex low density resins include a comprehensive range of homopolymer and copolymer grades, additive packages and natural masterbatches. The Innovene gas phase manufacturing process has been licensed worldwide, and almost 40 licensees currently use this ground-breaking technology. Rigidex HDPE is used many sectors of the packaging industry, with products for applications as diverse as small bottles, large drums and tanks, crates, pails, bottle caps, toys, technical parts and fibres. Rigidex HDPE and MDPE products supply the utility services and distribution industries. The main applications are in pressure and non-pressure piping systems, the coating of steel pipes with polyethylene, and the production of ducting to carry cables. Resins and compounds based on LDPE, LLDPE and HDPE, manufactured mainly at Cologne, Germany are supplied to the wire and cable market. Our plants based at Grangemouth in Scotland, Lavera in France, and Cologne in Germany produce high density and linear low density polyethylene for the film, coating, moulding, pipe, masterbatch and wire and cable markets. BP has three joint ventures producing polyethylene in the Asia Pacific region; PT Peni in Indonesia; PEMSB in Malaysia and Bataan Polyethylene Corporation in the Philippines. BP Amoco produces olefins at two manufacturing sites in Europe, Grangemouth in Scotland and Lavera in France. The sites have a combined ethylene cracking capacity of approximately 1.3 million tonnes per annum. Olefins produced at these two sites are used to supply BP Amoco derivatives, along with various external customers and joint venture partners in Europe and East Asia. Two former Amoco sites located at Feluy and Geel in Belgium have recently been integrated into the business. Feluy is a net consumer of 315,000 tonnes of ethylene per annum, whilst Geel consumes 480,000 tonnes of propylene. The Baglan Bay plant in Wales is also a consumer of ethylene and propylene for the production of isopropanol, ethanol and vinyl acetate monomer. Our European sales office, located at Sunbury-on-Thames near Heathrow, services the UK, France, Germany and Benelux. The BP Amoco Olefins European headquarters is also located in Sunbury-on-Thames. At the heart of the Grangemouth site are two crackers. These produce feed materials used by derivatives including the PP3 (polypropylene), PEX, Innovex and Rigidex (polyethylene) plants. These plants produce various grades of low and high-density polyethylene used in the manufacture of thousands of everyday items ranging from stretch wrap and fruit bags to gas pipes and plastic bottles. Raw materials for both crackers come directly from the North Sea's Forties pipeline system. The Grangemouth Unit 4 (G4) can crack 250,000 tonnes of ethylene per annum from both gas and light distillate feedstocks. The Kinneil Grangemouth (KG) unit is a gas cracker using mainly propane and butane as its raw materials. It has a capacity of 450,000 tonnes of ethylene per year. An effluent treatment plant that treats wastewater from both KG and G4 is one of KG's key features. This has radically improved effluent quality and is a testament to BP Amoco's commitment to environmental improvement. Any further waste products from both plants are ultimately recycled or used as fuel. Nothing is wasted. The two units produce 700KTe of ethylene per annum between them, although this capacity will increase to more than 1,000KTe per annum by 2001. Olefins at Lavéra are manufactured indirectly by BP Amoco through Naphtachimie, a 50:50 joint venture with Elf Atochem. Naphtachimie's Cracker 4 produces 700,000 tonnes ethylene, 500,000 tonnes propylene and 120,000 tonnes of Butadiene per annum. BP Amoco uses 50% of this output to supply derivative plants such as Appryl (Polypropylene) and Oxochimie (Oxo-alchohols) and third party customers. The BP Amoco Chemicals Feluy plant, located just south of Brussels in Belgium, is the largest western European producer of linear alpha olefins (LAOs) and the largest European producer of polyalphaolefins (PAOs). To meet the requirements of the industry, production capacity of LAOs is now 300,000 tonnes per annum. PAO production capacity on the site is 55,000 tonnes. BP Amoco Chemicals facility in Geel, Belgium is located on a 115 hectare site, 45 km east of Antwerp. The plant's operations can be divided into two main streams. The commodity and speciality stream manufactures 900,000 tonnes of purified terephthalic acid (PTA) and 130,000 tonnes of purified isophthalic acid (PIA) per annum. These are used in polyester fibres, films and packaging resins, as well as in coatings and glass reinforced plastic resins. A 450,000 ton paraxylene plant on the site provides the raw material for the PTA. The polymer stream manufactures 500,000 tonnes per annum of polypropylene resins for use in fabrics, fibres and moulded plastics, for which the site consumes 480,000 tonnes of propylene per annum. BP Amoco Chemicals Marl in Germany consumes 100,000 tonnes of ethylene and 300,000 tonnes of benzene per annum. The plant manufactures styrene, polystyrene (PS) and expandable polystyrene (EPS). The acquisition of the Marl facility in 1997 has made BP Amoco Chemicals the second largest supplier of PS and EPS in Europe. BP Amoco Chemicals Baglan Bay plant is located in Port Talbot, 13 kilometers east of Swansea on the south coast of Wales. It is one of the company's three major petrochemical production centres in the UK. The 1000 acre site manufactures ethanol, vinyl acetate monomer (VAM) and isopropanol (IPA) from ethylene and propylene feedstock. BP Amoco's Olefins business in Asia is run from three offices based at Kuala Lumpur in Malaysia, Jakarta in Indonesia and Singapore. The strategic function of BP Amoco Olefins operations in Asia is to source and supply competitively advantaged olefins to our Joint Venture polymer manufacturing assets in the Asia Pacific region. We supply approximately 140,000 tonnes of ethylene to our joint venture polyethylene plants in Merak, Indonesia and Bataan, Philippines. A further 250,000 tonnes of propylene are supplied to our joint venture site at Balongan, Indonesia and to other third party customers. BP Amoco has a 51% share in the PT Petrokimia Nusantara Interindo (PT PENI) polyethylene plant in Merak, Indonesia. Other joint venture partners include PT Arseto Petrokimia (24%), Mitsui and Co Ltd (12.5%) and Sumitomo Corporation (12.5%). The plant manufactures 450,000 tonnes per annum of Linear Low Density Polyethylene (LLDPE), and High Density Polyethylene (HDPE) using BP Amoco's Innovene technology. In the Philippines, BP Amoco owns a 38% share in the Bataan Polyethylene Corporation (BPC) plant at Bataan. Other joint venture partners include Petronas and Sumitomo Corporation. Plant capacity will be 250,000 tonnes per annum of LLDPE and HDPE when operations commence in mid 2000. BP Amoco also has a 60% share in Polyethylene Malaysia (PEMSB) and a 15% share in Ethylene Malaysia (EMSB) at Kertih. BP Amoco has a 10% share of PT Polytama Propindo (PTPP) polypropylene in Balongan. The plant produces 180,000 tonnes per annum of polypropylene, based on Himont technology. The Olefins Asia business is responsible for marketing all propylene (approximately 210,000 tonnes per annum) produced at the Pertamina refinery at Balongan in Indonesia. Olefins Asia also manages the propylene pipeline supply operation between the refinery and the Polytama site. ＊Polytama Propindo was established as a joint venture between Tirtamas Majutama with 80% stake, BP Chemicals owns 10% share and Japan’s Nissho Iwai owns the rest 10%. Tirtamas Majutama had agreed to hand over its assets in the multibillion dollar project to Indonesian Bank Restructuring Agency(IBRA). Tuban Petro will then control 59.5 % of the shares in PT Trans Pacific, 80 % of PT Polytama Propindo, 50 % of PT Petro Oxo Nusantara, and 50 % of PT Pacific Fibretama. SOLVAY announced that it signed with BP a Memorandum of Understanding aimed at strengthening its portfolio. The agreement would lead to SOLVAY's transfer of its polypropylene (PP) business to BP and to BP's transfer of its engineering polymers business to SOLVAY. SOLVAY would also form joint ventures with BP in high density polyethylene (HDPE) in Europe and the Americas. In Europe, the two companies would combine their European high-density polyethylene (HDPE) businesses into a 50-50 joint venture. In the US, the agreement would lead to SOLVAY and BP creating a 51-49 joint venture for SOLVAY's current HDPE business. BP Solvay Polyethylene North America is one of the global marketplace's most exciting new companies. A joint venture between British Petroleum (BP) and Solvay S.A., our combined roots in the chemical business go back almost 140 years. Annually BP Solvay Polyethylene produces 1.8 billion pounds of Fortiflex high-density polyethylene (HDPE) at its production facilities in Deer Park, TX. - The acquisition by Solvay of BP’s engineering polymers business. - The setting up of two joint ventures in high density polyethylene ("HDPE"), which together are one of the leading players worldwide, with a total turnover of approx. EUR 2.0 billion. Joint ventures in Europe (50/50) and in the USA (51/49) have been created under the new name "BP Solvay polyethylene". - And the divestment of Solvay’s Polypropylene (PP) activities where it was not amongst the global leaders (ranked 12th with annual sales of EUR 500 million). As result of the deal, BP has added Solvay’s global polypropylene business to its existing business and the two companies have combined their high-density polyethylene (HDPE) businesses into two joint ventures. BP has also transferred its non-core engineering polymers business to Solvay. Belgian chemical and pharmaceuticals company Solvay SA (B.SOL) Wednesday said that its U.S. joint venture with BP PLC - BP Solvay Polyethylene North America - will discontinue production of 260 million pounds of high density polyethylene (HDPE) capacity from three small-capacity lines at its Deer Park, Texas manufacturing site at the end of July. The capacity being removed from the Deer Park site is being replaced by production from a new 700 million pound HDPE slurry loop plant at Cedar Bayou, Texas, in which BP Solvay Polyethylene owns a 50% interest. The recent, successful startup of the new Cedar Bayou, Texas HDPE plant, jointly owned by BP Solvay Polyethylene North America and Chevron Phillips Chemical Company L.P, enables BP Solvay Polyethylene to improve the overall economics and efficiency of its operations. BP Amoco announced today that, as a result of its combination with ARCO, the company will assume two thirds ownership in ARCO Polypropylene, LLC, a joint venture between ARCO and the Itochu Corporation of Japan. The joint venture consists of a recently constructed 200,000 tonne per year polypropylene plant in Carson, California. BP says it will permanently close about 32% of its North American polypropylene (PP) capacity. The company will shutter two unitsーa 261,000-m.t./year plant at Bayport, TX and a 205,000-m.t./year unit at Chocolate Bayou, TX. BP idled the Chocolate Bayou unit late last year, citing weak demand and poor margins. The Bayport plant will be closed by June. The closures will leave the company with PP capacity of 625,000 m.t./year at Chocolate Bayou, and 386,000 m.t./year at Deer Park, TX. BP obtained the Deer Park plant as part of a swap deal with Solvay Polymers. BP also has about 180,000 m.t./year of PP production at a joint venture with Itochu at Carson, CA, obtained in its 2000 acquisition of Atlantic Richfield. Indonesian polyethylene joint venture PT Peni is to be sold after shareholders (BP 75%, Mitsui Corp 12.5% and Sumitomo Corp 12.5%) decided that the verticle integration needed to improve the JV's profitability would be best achieved under new leadership, a BP spokesperson said Friday. BP had also agreed in-principle to sell its 39% share in a PE JV in the Philippines, Bataan Polyethylene, because of poor returns. BP announced today that it has begun detailed engineering design for the construction of a new world-scale purified terephthalic acid (PTA) production plant at its Geel petrochemicals site in Belgium. The plans envisage construction of a 700,000 tonnes a year PTA plant at Geel. The official groundbreaking for a world-scale purified terephthalic acid (PTA) plant took place in Zhuhai, one of China's special economic zones, in November. Targeted for completion in December 2002, the $408 million complex will be owned and operated by the Amoco Zhuhai Chemical Company, a three-year-old joint venture between BP (80%), the Fuhua Group, a subsidiary of the Port Enterprise Group (15%) and the China National Chemical Fibre Company (5%). China American Petrochemical Co. (CAPCO) will become the world's top supplier of pure terephthalic acid (PTA) after its sixth PTA plant starts production in early 2003. CAPCO is a joint venture of BP-AMOCO, which has a 50 percent stake, and Taiwan's state-run Chinese Petroleum Corp., which holds 25 percent. BP announced today that it will close its low density polyethylene (LDPE) manufacturing operations at Wilton on Teesside. The company cited difficult market conditions as the reason for closing the 100,000 tonne a year plant. The Wilton plant, built in 1973, uses high-pressure autoclave technology to manufacture low-density polyethylene for use by customers in a wide range of products such as film applications. BP acquired the plant from ICI in 1982. BP today announced that it is to sell Innovene, its olefins, derivatives and refining group, to UK-based INEOS. The $9 billion cash sale, subject to regulatory approvals, includes all Innovene's manufacturing sites, markets and technologies. The sale is expected to be concluded early in 2006 at which time payment will be received by BP. Innovene is the 100 per cent BP-owned group created in April 2005. It has 8,000 staff, manufacturing facilities in seven countries in North America and Europe; $18 billion revenues in 2004; $13 billion of gross assets; $9.9 billion of net assets; pre-tax profits (Jan-Jun 2005) of $0.7 billion; 18 million tonnes of annual petrochemicals capacity and 412,000 barrels per day of crude oil refining capacity. BP announced the separation of its olefins and derivatives business in April 2004. It then added two refineries (Grangemouth, UK, and Lavera, France) to the business in November 2004, and created the 100% BP-owned Innovene subsidiary in April 2005. BP is the world's second largest integrated oil and gas company, operating in more than 100 countries with over 100,000 staff and turnover of $285 billion. INEOS is a leading global manufacturer of speciality petrochemicals and comprises 10 business units each with a major chemical company heritage. Its production network spans 46 manufacturing facilities in 14 countries. BP Zhuhai Chemical Co. (BP Zhuhai), an 85:15 jv between BP and FuHua Group, has got the final approval from NDRC for its 900 000t/y PTA project in Zhuhai, Guangdong Province. This is BP's second PTA project in Zhuhai. With total investment is RMB 3.02 billion (USD 377 million), the project is expected to start up by the end of 2007. PX feedstock will be sourced from Sinopec Maoming Petrochemical who is building a 600 000t/y PX plant in Maoming, Guangdong Province, and it should be operational from 2007. Acetic acid will be secured from the jvs of BP and Sinopec both in Chongqing and in Nanjing. Yangtze River Acetyls Co (Yaraco) - a jv of BP and Sinopec - has 350 000 tonne/year acetic acid capacity in Chongqing; BP YPC Acetyls Co -another jv of BP and Sinopec - is building a 500 000 t/y acetic acid project in Nanjing, Jiangsu Province. In Feb. 2006, the SEPA ordered checks on 127 petrochemical projects in terms of potential risks of chemical pollution. BP Zhuhai 900 000t/yPTA project was involved while it did not be impacted by the environment issue. Currently, BP Zhuhai operates a 350 000t/y PTA plant in Zhuhai. BP Zhuhai Chemical Co. Ltd. (BPZ), a chemical producer of Purified Teraphthalic Acid (PTA), is located in Zhuhai, Guangdong province of China. Zhuhai is located adjacent to Macau and approximately 35 km across the mouth of the Pearl River from Hong Kong. BPZ is the first Sino-foreign joint venture producing and selling PTA product in China. This joint venture is 85% BP and 15% Fu Hua Group. It has started up the initial operation activities in January 2003 and its annual production capacity is 350,000 tons. BPZ's producing capacity is capable of reaching 500,000 tons per year. Based on the successful launch of the first phase, BPZ will continue to seek the support from the Chinese government in growing its world-class PTA manufacturing facility. Technip announced on May 10th, 2006 that it has been awarded by BP Zhuhai Chemical Company Limited, a joint venture between BP and Zhuhai Fuhua Group, a services contract for the development of a new world-scale PTA (purified terephthalic acid) plant at their site in Guangdong Province. The contract, which covers the management of the development, will be executed by a team integrated with the client. Technip's operations and engineering center in Rome (Italy) has responsibility to execute the contract, which falls within the framework of the on-going alliance between BP and Technip in the PTA domain. The new plant, with a capacity of 900 000 t/a, will be the first to employ BP's latest technology and is expected to come on stream at the end of 2007 to meet China's growing demand for PTA. BP held a ground breaking ceremony to herald the construction of its new purified terephthalic acid plant in Zhuhai, China on Friday. The new unit will be an expansion of BP Zhuhai, an existing joint venture between BP and Fu Hua Group, said a company source Monday. When commissioned at the end of 2007, it will be the world's largest single train PTA unit with a capacity of 900,000 mt/year, and will bring the combined capacity from the company's Zhuhai site to 1.4 million mt/year, the source said. On July 17, BP starts construction for its No.2 PTA project in Zhuhai, Guangdong Procince. The new 900 000 tonne/year PTA plant is operated by BP Zhuhai Chemical Co. (BP Zhuhai), an 85:15 jv between BP and FuHua Group. With total investment of RMB 3.02 billion (USD 377 million), the project will use BP's latest state-of-art technology. According to BP, this plant will be the largest and most efficient PTA project in China. Compared to traditional PTA technology, BP's technology use in Zhuhai, will reduce green-house gas emissions by 65%, liquid waste discharges by 75% and solid process waste by 40%. In Feb. 2006, the SEPA ordered checks on 127 petrochemical projects in terms of potential risks of chemical pollution. BP Zhuhai project was involved while it did not be impacted by the environment issue. The PX feedstock will be sourced from the under-building 600 000 tonne/year PX project of Sinopec Maoming Petrochemical, which is expected to start up in 2007. Acetic acid will be secured from two jvs of BP and Sinopec -- Yangtze River Acetyls Co and BP YPC Acetyls Co.
Yangtze River Acetyls Co (Yaraco) has 350 000 tonne/year acetic acid capacity in Chongqing; while BP YPC Acetyls Co is building a 500 000 t/y acetic acid project in Nanjing, Jiangsu Province. The plant is expected to be commissioned by the end of 2007 and will bring the combined PTA capacity of BP in Zhuhai site to 1.4 million tonne per year. German energy and special chemicals company E.ON and UK oil company British Petroleum agreed to swap a couple of their German oil and gas businesses, the chairmen of the two companies told. Under the terms of a contract signed, E.ON will hand over its petroleum subsidiary, Veba Oel, to BP. The deal also means that Veba Oel's subsidiary, Aral, Germany's largest gasoline station chain, will also pass into British hands. In return, E.ON will acquire Gelsenberg from BP. Gelsenberg holds 25.5 % of Ruhrgas, Germany's leading gas distributor. The two linked transactions carry important strategic implications for both companies, said E.ON Chairman Ulrich Hartmann at the press conference held together with BP Group CEO John Browne. Both for E.ON and for Veba Oel, BP not only represented a partner of the highest order, said Mr. Hartmann. The petroleum giant was also the only partner with whom such a deal of this strategic quality could have been cut. It provided the Duesseldorf-based company with a unique opportunity to sell Veba Oel while refocusing E.ON's energy activities by a novel growth step in its core natural gas business, he said. Veba Oel, sources in Duesseldorf say, will become BP's most significant subsidiary in Germany. The transaction provided BP with the opportunity to improve its market position in Germany in one fell swoop by acquiring the largest and, at the same time, a highly efficient gasoline station chain in the world's third-largest economy. Mr. Browne called the deal a fortuitous meeting of interests. Its new ownership of Aral gives BP 25 % of the retail market in Germany and puts it clearly in a leading position. It also gives it some 15 % of the European market. Mr. Browne confirmed that it was BP's intention to group all its gasoline retail activities in Germany under the Aral banner. On the other hand, Aral service stations abroad, in Poland or Austria for example, will fly the BP flag. More important even than market share, however, will be the high level of efficiency that can now be achieved in Germany, said Mr. Browne. With the acquisition of Veba Oel, BP expects annual synergism and savings of at least $ 200 mm. The merger will also mean that around 1,500 of more than 40,000 jobs in total will disappear. Both companies believe that the German Federal Cartel Office in Bonn will be responsible for reviewing the gas-related aspects of the deal. The EU Commission in Brussels will be responsible for checking any competition questions relating to BP's acquisition of Aral's gasoline stations. Ulf Boege, president of the German Federal Cartel Office, has expressed concern about concentration in German gasoline retailing, pointing out that the two largest players, Shell/RWE/DEA, on the one hand, and BP/Aral, on the other, could now together represent more other than 50 % of the total gasoline retail market. Peter Sutherland, chairman of BP, yesterday stamped his authority over the energy group by forcing Lord Browne, its widely admired chief executive, to announce he would retire at the end of 2008. However, even as the company was trying to draw a line under the row, lingering tensions between the two camps resurfaced, particularly over a now-abandoned plan for BP to pursue a merger with Royal Dutch Shell, the company's European rival. People close to Mr Sutherland and Lord Browne denied that the idea - resisted by the chairman and other board members - fuelled tension between the two. The move, described earlier this week by sources close to Lord Browne as a "significant potential merger", was yesterday officially dismissed as nothing more than "scenario planning".